This capability represents how the value chain can cope with fulfilling customers’ expectations, by providing technical solutions that realize the functional requirements. This axis arbitrarily gathers many shoe attributes in order to have only one parameter that, as per convention, is called “Capability to satisfy functional request “. The main shoes features related to this capability are Shock absorption, Flexibility, Transpiration, Thermal and Material as shown in the figure. For instance the capability to satisfy Shock absorption customization is nonexistent for a system that offers a shoe without shock absorption element or material, this capability increases if it is possible to choose within a set of shock absorption degrees. The maxima of that capability is obtained with the possibility to make the shoe with a customer defined Shock absorption level by choosing the material, the dimensions of the sole and some parameters of the absorption device. This concept can be transposed for each represented shoe feature and their combination gives the degree of the capability to satisfy functional request of a value chain. Some features can affect more than one capability. 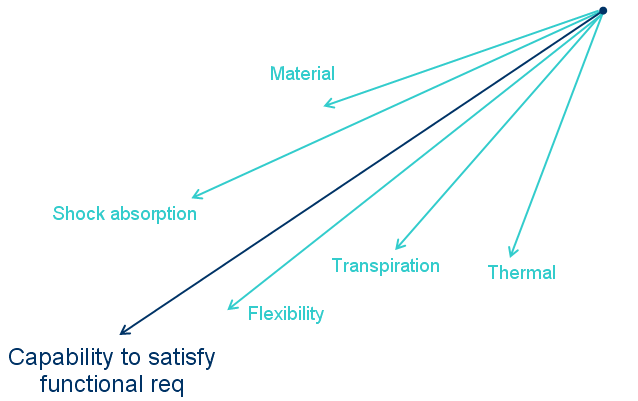 For example, the Material customization is also an aspect of theCapability to satisfy aesthetics customization . Thermal and Transpiration customization can affect the Capability to satisfy fitting but their influence is so marginal that conventionally it can be ignored.